Be the first to share your favorite memory, photo or story of Jetta. This memorial page is dedicated for family, friends and future generations to celebrate the life of their loved one. 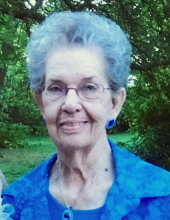 Jetta Frances Wagner, resident of Ponca City, passed away on Monday, January 21, 2019 at Via Christi. She was 88 years old. A memorial ceremony for Jetta will be held at the Trout Funeral Home Chapel on Monday, January 28, 2019 at 1:00 pm with Justin Pickup officiating. Cremation arrangements are under the direction of Trout Funeral Home & Crematory. Jetta was born on July 19,1930 in Shamrock, Oklahoma to her parents, Charles A. Wood and Nora L. (Moore) Wood. Jetta enjoyed genealogy and learning about her family's history. She loved to bake bread and eat it as well! She was an avid reader and also loved gardening, yard work, and enjoyed her beautiful flowers. She is survived by her son, Gary Cramer and wife Anita, daughters, Kathy Doyal and Lee Ann Cramer, grandchildren, Lisa Stewart, Marla Scott, John Cramer, Laura Murray, and Casey Doyal, great-grandchildren, Brendyn Burns, Kamryn Burns, Cale Brady, Harper Murray, Miles Scott, Drake Mullin, and Daylon Mullin. Jetta was preceded in death by her parents, siblings, Georgie Lee, Gladys, Charles, and Clyde, and two husbands, Joseph Cramer and R.V. Wagner. To send flowers or a remembrance gift to the family of Jetta Wagner, please visit our Tribute Store. "Email Address" would like to share the life celebration of Jetta Wagner. Click on the "link" to go to share a favorite memory or leave a condolence message for the family.